This is the tenth posting in a series of messages responding to the recommendations of a so-called “No-Kill Equation”. The “No-Kill Equation” is comprised of ten commonsense, long-standing practices embraced and implemented by LA Animal Services with remarkable results. This analysis compares the “No-Kill Equation” to LA’s programs and practices. Today’s message focuses on the tenth recommendation of the “No-Kill Equation,” which is A Compassionate Director. The No-Kill Equation is in this blue font. The analysis will be in italics. The final element of the No Kill equation is the most important of all, without which all other elements are thwarted—a hard working, compassionate animal control or shelter director not content to regurgitate tired clichés or hide behind the myth of “too many animals, not enough homes.” Unfortunately, this one is also oftentimes the hardest one to demand and find. But it is clear—as better than a decade of success in San Francisco, Tompkins County, and now elsewhere demonstrates—that No Kill is simply not achievable without rigorous implementation of each and every one of these programs and services. It is up to us in the humane movement to demand them of our local shelters, and no longer to settle for illusory excuses and smokescreens shelters often put up in order to avoid implementing them. This analysis was provided by Mayor Villaraigosa’s office: LA Animal Services’ current General Manager Ed Boks, hired in January 2006, is a retired pastor and former organizational development consultant. 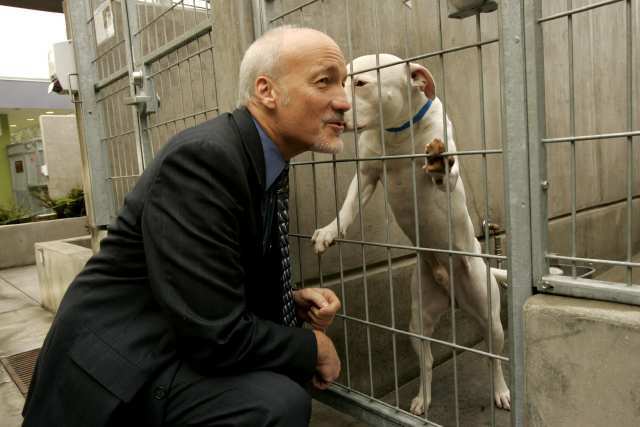 Boks brings a unique blend of management competencies to the Department, including more than three decades of animal welfare experience where he successfully introduced and implemented No Kill principles and programs as described in the “No-Kill Equation” in two of the largest animal care and control programs in the United States, Maricopa County, Arizona and New York City. His compassionate philosophy and programs have been profiled in USA Today, The New York Times, The New York Post, The Los Angeles Times, The Arizona Republic, and Newsweek, Best Friends, and Cat Fancy magazines. During Boks’ tenure in Los Angeles he has been recognized by Fred Bergendorff’s The Pet Place television show for “coming to the aid of animals and in doing so displaying selfless acts of courage, heroism and compassion” and by Voice For The Animals Foundation for his leadership role in “protecting the welfare of animals” through the Los Angeles Animal Cruelty Task Force. Boks demonstrably possesses the knowledge and experience to guide LA Animal Services in the No Kill direction and has actively promoted a philosophy comparable to that expressed in the “No Kill Equation” for many years. Boks brought in a new human resources team to institute vigorous performance review and disciplinary procedures consistent with City requirements that the Department had not routinely followed for many years. Training in a variety of skills and information areas is being offered to staff on a regular basis. “Secret shoppers” visit the animal care centers and critique conditions, customer service, signage and other aspects of operations to aid management in fine-tuning those operations and upgrading staff performance. The Department’s veterinary team has been completely reconstituted and its management and administrative teams re-structured, rebuilt and reinvigorated. Additionally, the Department is systematically pursuing legislative amendments to improve its ability to promote adoptions and retention, fight animal cruelty and illegal animal sales, and address other issues of concern to the humane community and pertinent to the pursuit of its No Kill goal. Since coming to Los Angeles Boks has applied his expertise to feral cat issues, spay/neuter issues, rescue groups and foster care programs, adoption and pet retention efforts, medical and behavioral rehabilitation, public relations and community involvement. The Department continues to progress via increasing adoptions and reducing euthanasia since his arrival. In fact, in 2007 under Boks’ leadership the Department achieved its most significant decrease in euthanasia in any one-year period – 22%, which confers upon the City of LA one of the lowest euthanasia rates in the nation.